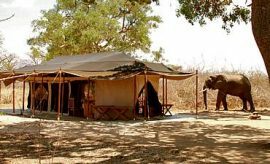 Mdonya Old River Camp in Ruaha National Park, Tanzania, is a quiet and peaceful setting for a historically authentic safari vacation in Africa. 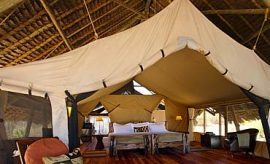 A small, intimate tented “Adventure Camps Of Tanzania” base set in acacia and fig woodland; it is frequented by numerous wild animals, including ponderous elephants, some with immense ivory tusks, head-in-the-air giraffes, confusingly striped zebra, fragile dik-diks, stately kudu, elegant impala, bulky buffaloes, predatorous lions, watchful leopards and many more. 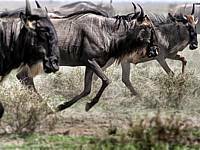 Ruaha National Park consists of over 20,000 square kilometers of largely uncharted wilderness which is accessible to visitors looking for an offbeat experience. 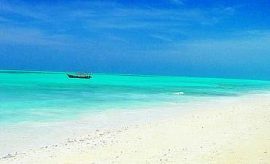 Since its expansion in 2008, it is now the largest national park, (as opposed to a game reserve) in Tanzania. Unlike a game reserve, it has a strict policy of confining visitors to a wide-ranging network of roads, but since the area is challenging to access and largely undiscovered, this pristine park still often allows AfricanMecca guests on their authentic safari in Tanzania to feel alone in a primeval world. 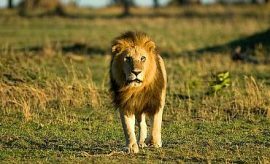 The Ruaha Park is famed for its birdlife with over 570 species recorded to date, not to mention a large number of lion prides and many other rare and endangered mammals to see on a trip in Ruaha. 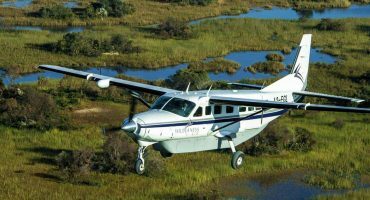 From Dar es Salaam, a flight of two hours deposits you at Msembe Airstrip where you will be met by jeep by your safari guide and taken a further one to two-hour introductory game drive through many varied landscapes, across the Great Ruaha River to the Mdonya Sand River at the foot of the imposing Ruaha Escarpment. Mdonya Old River Camp was designed as a simple, basic safari base replicating the African wildlife safari explorations in the colonial era, with only 12 simple Meru canvas tents, identified by the skulls of local animals; widely spaced along the arc of a sand river which migrating game use as a convenient corridor. Each tent has a large, shaded verandah with a simple safari chair, table and a canvas lounge seat amidst resident and transitory wildlife. 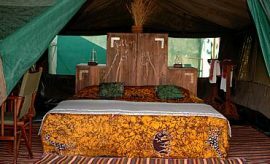 The tents can be adapted for single travelers or for couples, with single or double beds covered with brightly colored ethnic throws with wildlife prints. 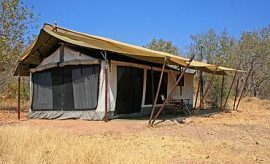 Two can have an extra room zipped in place of the verandah for a family group safari holiday stay in Tanzania although Ruaha is a preferred park for returning or experienced safari goers. Simple en-suite bathrooms with flush toilets have wash basins with hot and cold water which you empty into a bucket. They also feature a part open-roofed shower. The tent interior boasts a lockable chest, writing desk and chair, woven leaf makuti mats and an open, shelved storage system for clothes with hangers. Windows and doors have gauze insect-proof mesh. There is no electricity, so torches and candles are provided. Batteries can be charged at set times by generator power – primarily at night. 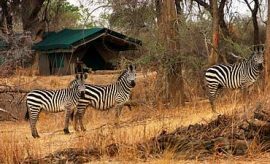 Because of the number of wild animals wandering in the camp during your thrilling tour in Ruaha, you will be escorted to and from your tent at night and sometimes during the day if need be, and children under six years are not accepted. There is a communal lounge serving complimentary coffee or tea, and a shop where you can buy books or souvenirs to support various community initiatives. A Mdonya Old River Camp safari is a 24-hour experience continuing even as you sleep to the sounds of crickets and various wildlife outside your tent, or when you sit on your verandah, shaded by tamarind trees with edible leaves, fruit and flowers (view map of Ruaha). They are popular with visiting elephants as a digestive aid. Nearby Faidherbia trees are also a favorite food of many passing animals from buffalo to baboons, although they do not appeal to zebras or warthogs. Sycamore figs are similarly edible. Therefore there are large numbers of indigenous creatures wandering around the camp. Surprisingly, these include a leopard, known to the guides as “Fundi”, mostly seen at night with his prey just feet from the main camp path. But to appreciate the true richness of Ruaha, one must take a land-cruiser safari of half or a whole day in an open-sided 4WD vehicle. 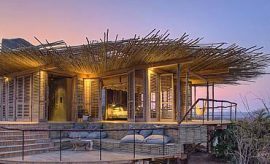 Your knowledgeable guide will point out things you would miss, a loving lioness and her cubs camouflaged in golden grass, a cheetah in sun-dappled shade or a leopard in a tree fork. He will also point out amazing butterflies, White Ladies, Gaudy Commodores and False Tigers with bright pink silk under-wings. For the reptiles, color-changing chameleons and painted Agama lizards catch one’s breath; as does the sheer diversity of bird life. 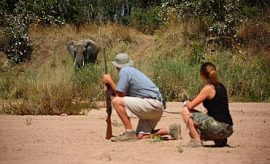 Your safari guide will drive by the hippo pool or identify rare ungulates, chunky Greater Kudu, and graceful Sable antelopes rarely seen elsewhere on tour in Africa amidst its stalking predators like the lions (read more on when is the best time to visit Ruaha in Tanzania with AfricanMecca). Food at Mdonya Old River Camp is an African travel adventure in itself since most foodstuffs are obtained locally and traditionally prepared. 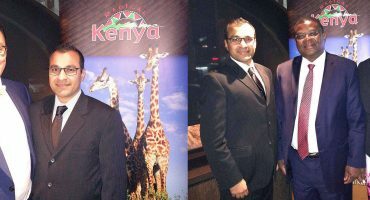 This is in accord with their eco-friendly approach and local community support programs. Although they do not serve wild game or baobab fruit, you might find a hint of tamarind flavoring or edible flowers in the salad. Every morning, the day begins with excellent Tanzanian tea or coffee before breakfast is served in the open dining tent with bread freshly baked every day in a wood burning oven using fallen logs to give a special relish to the food. These are supplied by "Mbomipa", a local sustainability initiative which gathers them outside the park since firewood may not be collected within Ruaha Park boundaries. Mozzarella, caciotta, and provolone cheeses are produced as a community project in association with an Italian company whilst a young women’s project provides additive jams and preserves. Lunch is also served in the mess tent or out in the bush, where diners can watch the game in the dry river bed. 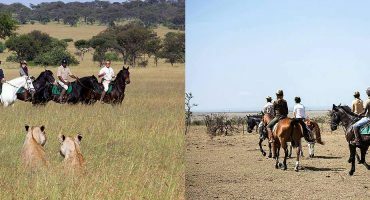 On this active-adventure tour of Tanzania, you can sit enjoying hot pizzas and other hot and cold dishes as elephants wave their trunks and flap their huge ears only yards away. After sundowners round a campfire, dinner is enjoyed al fresco by candlelight. Locally farmed meat and river fish are grilled over charcoal briquettes, which are also locally produced from chemical free biomass. Vegetarian and other dietary options are also available and needs to be requested at the time of booking and prior to arrival via AfricanMecca. 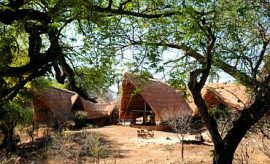 When staying at Mdonya Old River Camp in Ruaha, we recommend combining it with offbeat parks in Southern and Western Tanzania such as Selous or Katavi ending with a chimpanzee trekking safari at Gombe or Mahale.